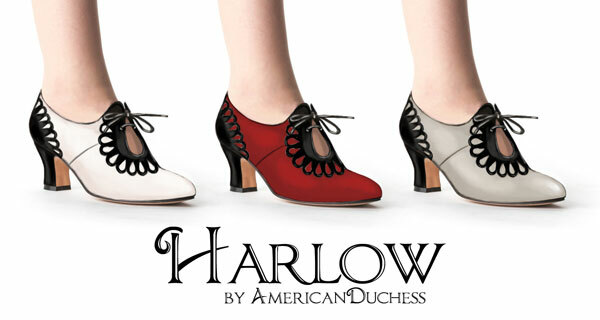 First Exclusive 1920s Shoes "Harlow" Coming Friday! Ladies, it's time to announce the winners of the first "Exclusives" cycle. We've affectionately named them "Harlow" after the glam goddess of the 1920s and 30s, and we're proud to present three different color choices, voted on by you. November 14 at 12 pm PST - sale runs for 48 hours! Unlimited ordering / Limited Production - we will only make as many pairs in each color as are ordered! * We are limited to women's sizes 6 - 11, and B width only. Sorry, we cannot make other sizes or widths. * The sale runs for 48 hours only. We cannot accept orders after the sale ends. * Exclusives will not appear on our website until the sale begins, or just before. They will be in their own section/tab called "Exclusives"
* EasyPay, gift certificates, and coupon codes CAN be used on Exclusives ONLY on the WEBSITE. * Sales on Facebook are handled through Soldsie. To register for Soldsie ahead of time, please click here. EasyPay, gift certificates, and coupon codes cannot be used on Soldsie. * All items in your order will ship together. Please allow 6 - 8 weeks for delivery of Exclusive designs. * For more information about Exclusives, please see our video, or read our FAQs.